Most of the time, when adults are looking for a Charlotte dentist to close gaps between their teeth, the best and most affordable way is our Six-Month Braces. However, sometimes circumstances get in the way, and porcelain veneers become a better and faster option. Tishka came to us in the late spring with an urgent mission – to brighten her whole smile and close the gap between her front teeth; the important event? Graduating from her MBA program! As a professional woman, heading out for interviews in the financial world, she knew that a great smile is super important when it comes to the all-important first impression. Even though braces would have been more conservative, there wasn’t enough time. Tishka wanted a dazzlingly bright smile, so she chose the Evolve Deep BleachingTM method for teeth whitening. After that, we shaped the 2 front teeth for porcelain veneers, impressed them with our CEREC digital impression technique, and 2 weeks later, Tishka had her Smile Makeover complete. If you’re looking for a Charlotte dentist who offers a complete range of options in cosmetic dentistry, make sure you take the time to truly investigate the RIGHT option for you. 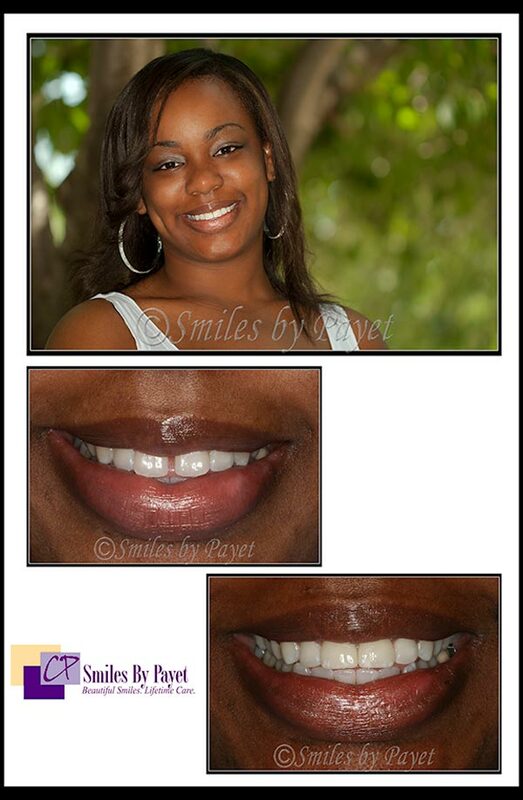 You can see more of our patients who have had Porcelain Veneers in our Before-and-After Photo Gallery. We aren’t just a cosmetic dental office, though, so if you’re in need of a good family dentist to take care of the kids, or in need of dental braces, or want an alternative to conventional gum surgery with a dental laser, we can take care of you!